This article is about the Sangheili title. For other articles including "Arbiter", see Arbiter (disambiguation). Arbiter is a title of the highest possible honor bestowed upon a Sangheili. Formerly appointed only by the Hierarchs of the Covenant during a time of need, the title is currently held by Thel 'Vadam who leads the Swords of Sanghelios after the Covenant's dissolution. The title was originally the greatest religious, military, and political rank of the Sangheili. After they joined the Covenant, however, the role was downplayed in importance somewhat, with the Sangheili High Councilors ranking higher in political matters. This would eventually change again: approximately 400 years before the Human-Covenant war, an Arbiter declared he did not believe in the Great Journey and was stripped of his rank and killed. Thus the title became a brand of shame. Arbiters were sent on highly perilous and suicidal missions by the Hierarchs. On these missions, the Arbiter was expected to die and to become another great martyr of the Covenant on their path to the Great Journey. This was seen as a way to regain, in part, their honor. Depending on the nature of his assignment an Arbiter would have either acted alone as a singular combatant, with support by Covenant military forces, or they were tasked to lead large numbers of Covenant troops. Notable Arbiters have been appointed by the Prophets during incidents such as the Taming of the Lekgolo, the Unggoy Rebellion, the Human-Covenant War, and most recently, the threat of the heretics led by Sesa 'Refumee. An ancient Arbiter stands atop a battlefield. The title of Arbiter dates back long before the Covenant, and long before the Sangheili became a space-faring race, originating on Sanghelios. The Arbiters of old were immensely powerful and skilled warriors who ruled over all Sangheili clans, described as "part king, part judge". Centuries before the Sangheili became space-faring, a tyrannical Arbiter took control of the entire continent of Qivro. However, the Arbiter was eventually overthrown by a coalition of kaidons known as the Swords of Sanghelios. The Arbiters continued to lead their species even after the Sangheili had colonized dozens of other worlds. When the San'Shyuum arrived in their Forerunner Dreadnought in 938 BCE on the Sangheili frontier colony of Ulgethon, an Arbiter initiated the War of Beginnings by decapitating a delegation of San'Shyuum and returning their heads to the Dreadnought for the other San'Shyuum Reformists to find. As the war began, this Arbiter led the Sangheili against the San'Shyuum during the war that lasted many decades. After the Writ of Union was ratified and the war had ended, the Hierarchs of the newly formed Covenant realized the importance of the title of Arbiter. Sesa 'Refumee: "An Arbiter was once the pinnacle of our people. Leader of the clans, and master of the battlefield. But then, an Arbiter committed heresy. And an example was made of him." Sesa 'Refumee: "He challenged the word of the Prophets. Challenged...and lost. So the title of Arbiter became a badge of shame for our most spectacularly failed warriors." An Arbiter blessed by a Hierarch. The establishment of the Covenant led to the Sangheili losing most of their traditions and history. However, the title of Arbiter was maintained as a position of power for the Sangheili. The appellation of Arbiter was bestowed upon the commander-in-chief of the Covenant military, and was regarded as a great privilege among the Sangheili race. Arbiter was a noble title only given to a Sangheili that was considered worthy of bringing justice and peace to the Covenant—some considered it a "badge of greatness". The Arbiter's authority would not be questioned by any other individual in the Covenant. Most notably, the Arbiter of the Covenant would serve as the "Will of the Hierarchs". At some point the year before or in 784 BCE, during an Age of Conversion, the Covenant's war with the Lekgolo species had proved itself to be significantly more difficult than anticipated. An Arbiter was tasked with traveling to the moon of Rantu to learn about the Lekgolo's strengths and weaknesses, and upon learning that the Lekgolo could combine into the powerful Mgalekgolo forms, he proposed the species' incorporation into the Covenant to the Hierarchs. The Hierarchs reluctantly agreed with the Arbiter, and the Lekgolo joined the empire. However, approximately four hundred years prior to the destruction of Installation 04, the contemporary Arbiter, Fal 'Chavamee, refused to accept the Covenant religion and was branded a heretic by the Hierarchs. The resulting chain of events, which led to the deaths of both 'Chavamee and a high-ranking kinsman named Haka, led to the Prophets changing the role of the Arbiter significantly. The title was thereafter given to disgraced Sangheili in order for them to regain their honor by way of suicidal missions of great importance to the Covenant as a whole. In part, the change was additionally made by the Hierarchs to secure their own power over the Sangheili; in many cases, brilliant Sangheili who asked too many questions or were otherwise seen as a threat to the Prophets were branded heretics and then appointed Arbiter to silence them and to keep the Sangheili without a strong leader of their own. During the Unggoy Rebellion of 2462, an Arbiter was appointed to put down the insurrection. The Arbiter commanded a fleet and partially glassed the Unggoy homeworld of Balaho, forcing the species to surrender and rejoin the Covenant. Arbiter Ripa 'Moramee meets his end in battle. After the outbreak of the Human-Covenant War, the Prophet of Regret made Ripa 'Moramee an Arbiter charged with the destruction of humanity. Acting as the Arbiter, 'Moramee led Covenant forces during the Harvest campaign, the Battle for Arcadia and the Battle of the Etran Harborage. The latter battle happened when the Prophet of Regret sought to unlock a fleet of Forerunner Sojourner-class dreadnoughts in order to win the war far more quickly. 'Moramee kidnapped Professor Ellen Anders from Arcadia at the end of the battle there to act as a Reclaimer to unlock the ships for the Covenant. 'Moramee's ship was followed to the Etran Harborage by the Phoenix-class support ship UNSC Spirit of Fire where the human vessel worked to rescue Anders and foil the Covenant plot. Near the end of the Battle of the Etran Harborage, Arbiter Ripa 'Moramee was killed by Sergeant John Forge with his own energy sword. The planet and its fleet of Forerunner ships were subsequently destroyed by the Spirit of Fire and her forces, foiling the Covenant plot. Thel 'Vadamee, the last Arbiter of the Covenant. In 2552, after the destruction of Installation 04 by John-117, Supreme Commander Thel 'Vadamee was branded a heretic for his failure to protect the Halo installation. Rather than be executed, he was declared an Arbiter by the Hierarchs. 'Vadamee was tasked with eliminating heretic leader Sesa 'Refumee, and was later charged with retrieving the activation index of Installation 05. However, after recovering the index, the Arbiter was betrayed by Tartarus, Chieftain of the Jiralhanae, who had been ordered to lead an armed coup against the Sangheili by the High Prophet of Truth. However, 'Vadamee survived Tartarus' assassination attempt and proceeded to lead the Sangheili against the Covenant in the Great Schism. Rescued by the Gravemind, 'Vadamee learned the truth of the Halos and the Great Journey from the Flood leader with the help of John-117, the human warrior who had disgraced 'Vadamee by destroying Installation 04. Due to a combination of desperation and disillusion with his former beliefs, the Arbiter allied with the UNSC. Together, the Sangheili and the humans were able to defeat the Covenant at Installation 00, with 'Vadam executing Truth, the last Hierarch of the Covenant, himself. During this final battle, 'Vadam fought side-by-side with John-117, the two former mortal enemies creating a formidable force. "After the breaking of the Covenant, the Sangheili hero known as Thel 'Vadam returned home, bearing the title and armor of the Arbiter-once considered a mark of shame, now worn as a badge of honor." After the Human-Covenant War ended, the Arbiter ratified the Treaty of 2552 with the Unified Earth Government to declare peace between the Sangheili and humanity. The Arbiter established the Swords of Sanghelios and attempted to unify the Sangheili species, although he did not receive universal approval among the Sangheili. 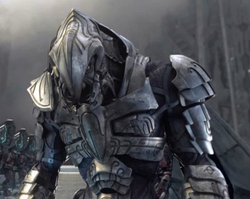 Some believed that Vadam's very existence was heretical as he did not sacrifice himself in battle as was traditional of Arbiters in the Covenant. As such, many devout believers regarded Thel a "false Arbiter". In 2553, Thel 'Vadam traveled to each state of Sanghelios to make his case for permanent peace with humanity. During his visit to Mdama, he announced that he no longer felt he was an Arbiter, but simply a kaidon. Despite this, Thel 'Vadam continues to hold the title of Arbiter as of October 2558. "The tasks you must undertake as the Arbiter are perilous, suicidal. You will die, as each Arbiter has before you." The Arbiter that quelled the Unggoy Rebellion. Originally, the function of Arbiter was to serve as the ruler of the Sangheili species. When the Covenant was established, the title of Arbiter was one of the few pieces of Sangheili culture that was left unmolested by the San'Shyuum. The Arbiter continued to serve as the commander-in-chief of the Covenant military and served as the guardian of the Great Journey. After the function of Arbiter was altered approximately four hundred years prior to 2552, the Arbiter followed the direct orders of the Hierarchs. Every Arbiter was chosen during a time of great conflict. Arbiters were charged with carrying out extremely dangerous missions that were meant to redeem themselves from past sins and heresies through death. Although the Arbiters were aware that their title was a death sentence, they would gladly carry out the Hierarchs' missions and anticipated a glorious death to regain lost honor. To most members of the Covenant, especially the Unggoy, the Arbiter was seen as a savior in times of dire need; their Sangheili peers consider them the living embodiment of the "Will of the Prophets". Their corpses—or presumably memorials in some cases—were housed in identical caskets in the Mausoleum of the Arbiter. In the center of this room was a floating pod that contained the armor of the Arbiter when one was not currently appointed. This armor, while highly decorative, is fully functional as battle armor. Though considered a commanding role of high esteem, the Arbiter was condemned to a life of suicidal missions to regain his honor. This includes the current Arbiter, Thel 'Vadam, who was branded a heretic for his failure to protect one of the sacred Halo rings from the so-called "Demon", SPARTAN-II John-117. Although the Arbiter is a singular warrior, he has the authority to give orders to other Covenant soldiers; this command can be likened to that of a UNSC four-star general. Arbiter Ripa 'Moramee once activated his energy swords in the presence of a Hierarch, something that was normally seen as an act of aggression against the Prophet and was punishable by death. His status as Arbiter is likely the only reason the nearby Sangheili Honor Guardsmen did not kill him on the spot. While the honor of the title was restored after the dissolution of the Covenant, the function and role of the contemporary Arbiter are quite dissimilar from those of the judge-kings of ancient times. Thel 'Vadamee is appointed Arbiter. 343 Guilty Spark: "Looking back at the record of the Arbiters you've discussed, was it not surprising to anyone that those chosen to become Arbiter were more than simple warriors?" 343 Guilty Spark: "Each of them had significant political influence among your people. In some cases, that influence was already being used to question the decisions of your Hierarchs. In fact, that very questioning often gave rise to the charges of heresy that so neatly removed the challenger from the Hierarchs' concern." When an Arbiter was chosen within the Covenant, he was usually a highly skilled Sangheili warrior who, through either chance or misdeed, had severely disgraced himself in his line of duty. The rank of the Sangheili prior to becoming Arbiter presumably had no effect on the chance of becoming Arbiter, though higher-ranked Sangheili had better chances due to their more extensive experience and superior skill. The rank of Arbiter was considered a very prized reward, especially as it allowed the individual to die honorably rather than be shamefully executed. While there were many known cases of the mantle of the Arbiter being used to snuff out potential challengers to the Hierarchs' power over the Sangheili, in other cases such as that of Ripa 'Moramee, brutish individuals with a high propensity for violence were chosen instead. There were lines of succession for the title of Arbiter. For example, Ripa 'Moramee was the Seventeenth Arbiter in the Line of Immaculate Succession. Arbiters were only selected during a time of great conflict, such as during the Human-Covenant War or the Unggoy Rebellion. They were appointed only by the Hierarchs of the Covenant. Thel 'Vadamee donning the helmet of the Arbiter for the first time. Each Arbiter receives a unique set of armor that is built according to an age-old design from before the Covenant. The very nature of the Arbiter means that they are sent on dangerous, often suicidal missions, where recovery of the corpse and the armor it wears may be impossible. The armor of the Arbiter is kept in the Mausoleum of the Arbiter until it is bestowed upon a new holder of the title. It is composed of a silvery-bronze colored metal with ornate engravings and metal work, indicating the Arbiter's ceremonial nature. However, it is fully functional as a combat suit, incorporating a heads-up display, an energy shielding system, and active camouflage. The armor incorporates a form-fitting bodysuit and blue restraining straps. Contrary to the claims of the Hierarchs, the Arbiters' armor is generally, if not always, replaced between wearers, as it is often irreparably damaged when an Arbiter is killed. This was the case with Ripa 'Moramee, whose body was pushed several kilometers off the Apex Site and was subsequently destroyed by a supernova. The technology used in the armor is similar to the standard Sangheili combat harness, though it is of an older design and considered "not state-of-the-art". While modern Covenant active camouflage has a virtually unlimited duration, the Arbiter's camouflage lasts only for a few seconds, though still enough to give him a tactical advantage. The armor may be subject to some small amount of customization. Ripa 'Moramee was taller than most Sangheili, at over 8'1'', while Thel 'Vadam stands at 7'10''. Furthermore, when first donning the armor, 'Vadam lacked mandible guards or a shoulder-mounted light that he possessed after the Great Schism, where his active camouflage was also significantly upgraded. In addition, when the Arbiter was sent on missions requiring specialized armor, such as during the Taming of the Lekgolo where an Arbiter required a vacuum suit to breath on Rantu, they would be given a variant that was more suitable for the occasion. As of 2558, Arbiter Thel 'Vadam dons a ceremonial battledress that he believes serves as tribute to traditional armor style previously worn by the Arbiters, while also serving as a symbol of transition that represents his new-found role as a leader of his people and of a united Sanghelios. Ripa 'Moramee, the seventeenth Arbiter in the Line of Immaculate Succession. Judge-King of Qivro – who was a tyrannical leader, overthrown by the original ancient Swords of Sanghelios. Unidentified Arbiter – who led the Sangheili during the War of Beginnings. Unidentified Arbiter – during the Taming of the Lekgolo, tasked with pacifying the Lekgolo resistance. Fal 'Chavamee – during the 2100s (approximately four hundred years prior to 2552). 'Chavamee's refusal to accept the Covenant religion led to the rank of Arbiter being converted into a badge of shame. Unidentified Arbiter – during the Unggoy Rebellion, tasked with quelling the uprising. Ripa 'Moramee – The seventeenth Arbiter in the Line of Immaculate Succession who led Covenant forces on Harvest, Arcadia, and the Etran Harborage. Turned into an Arbiter by the Prophet of Regret to lead the destruction of humanity before falling in battle to Sergeant John Forge. Thel 'Vadam – Arbiter who quelled the heretics led by Sesa 'Refumee and later led the Sangheili during the Great Schism. Last Arbiter to be appointed prior to the Covenant's fragmentation. In Halo 3, the Arbiter's armor is different from its appearance in Halo 2. The Arbiter's mandibles in Halo 2 are unprotected, while in Halo 3, the armor covers the mandibles. Also, the Halo 2 Arbiter armor is silver/gray, while the Halo 3 armor is closer in coloration to copper or bronze, though this is due to the improved lighting effects, as his armor is gray in levels with sparse light. Similarly, the Arbiter has a flashlight on his left shoulder, but it only works when playing with other players or a guest. The Arbiter was originally meant to be called the "Dervish". The name was changed because it might create an unintended parallel between the game and the real-life conflict between the Western World and the Middle East. In the Spanish language versions of Halo 2 and Halo 3, the Arbiter is called "Inquisidor". This is because the cognate "árbitro" means "referee", and the title would thus be lost in translation. Before Halo 2 was released, the Elite bipeds in Multiplayer had the armor of an Arbiter, but their armor was changed to the regular Elite armor. In Halo 2, the Arbiter's right side shoulder armor contains a mini sculpt of the Legendary Difficulty Skull. This can be seen in cutscenes and in co-op. An arbiter is someone who settles negotiations and disputes between parties. Decisions made by an arbiter are legally binding and endorsing. An Arbiter appears in the Xbox One videogame Killer Instinct as a playable character. While marketed primarily as the Arbiter, the character is envisioned as a canonically flexible amalgamation of several Arbiters rather than any particular individual and can be clad in various Sangheili armor sets. Arbiter appeared in Konami's Super Bomberman R as one of the three exclusive characters in the Xbox One version. He is known as Arbiter Bomber, a Covenant bomberman from Planet Halo. He is an attack typed bomber and his special ability is Meditate. The armor of the Arbiter in Halo 2. Thel 'Vadamee accepts the title of Arbiter. 'Vadamee at audience with the Hierarchs. An early concept of 'Moramee's armor for Halo Wars. A later, more traditional concept of Ripa 'Moramee's armor. Fal 'Chavamee, the last Arbiter to bear the title as a badge of honor, in Halo Legends: The Duel. Updated appearance of 'Vadamee in Halo 2: Anniversary. An Arbiter leading his people in Halo 2: Anniversary's terminals. An Arbiter raises his blade as a crowd cheers. An Arbiter on Ulgethon observes the San'Shyuum's Forerunner Dreadnought. The Arbiter of the San'Shyuum-Sangheili War. The Arbiter who oversaw the Taming of the Lekgolo. The Arbiter who quelled the Unggoy Rebellion. The Unggoy surrender to the triumphant Arbiter, before allowing them entry into Sangheili units. Two Arbiters (based on Thel 'Vadam's Halo 5: Guardians and Halo 2: Anniversary appearances, respectively) dueling in Killer Instinct.